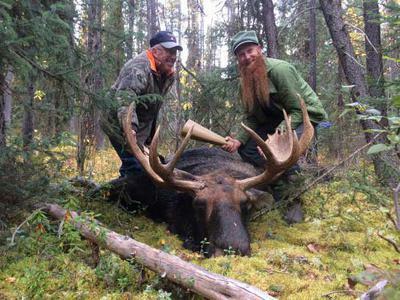 Set your sights on a BIG moose! Call one in with our moose call. For starters, if you are thinking of hunting in British Columbia or the Yukon Territories you will either have to be sponsored by a friend or relative, or use a professional guide. I'm guessing a guide for you? I'm not sure you will find a "100% sure chance" for a moose, although many guide outfitters can boast of having a (close to) one hundred percent success rate. I would venture to say you are going to have to save some more money in order to go on a guided hunt. Really! $5,000 is not going to do it for a guided moose hunt. Probably a low end of 8k to a high of well over 20K depending on your chosen out fitter. Do your research and see what you can find. I think more like 8K each may be doable but it won't be a fly-in remote hunt. It may be a horse back, boat, ATV or truck hunt. That will also depend on your own physical condition. Keep in mind too that the cost of the hunt will not include such things as your non-resident license fees, royalty fees, meat processing and the cost of getting to/from to the departure point. In British Columbia there are 166 guide outfitters and they are all listed on the GOABC website. Also, if you are thinking of a hunt in 2018, you should start shopping now. Most GOOD outfitters sell out a year in advance.